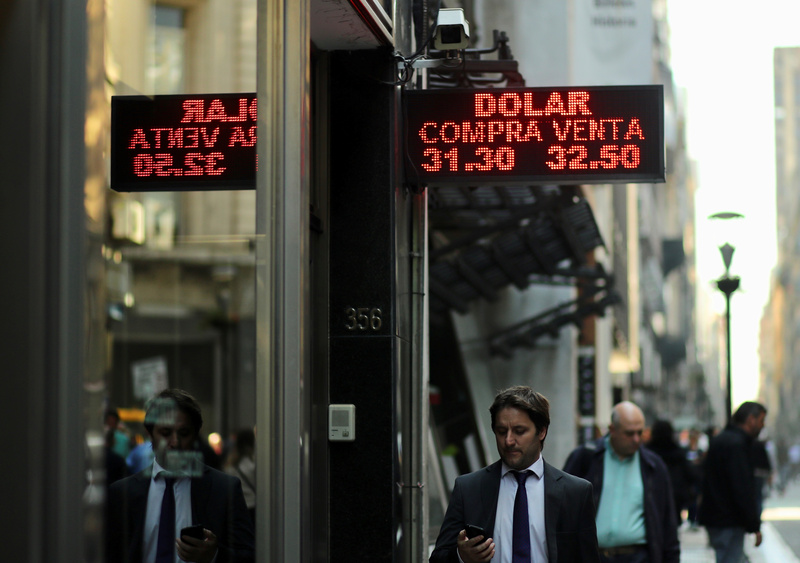 People walk past an electronic board showing currency exchange rates in Buenos Aires' financial district, Argentina August 29, 2018. Argentina’s central bank raised its benchmark interest rate to 60 percent from 45 percent on Aug. 30 in an effort to control inflation and defend the peso, and cabinet chief Marcos Peña said the government was looking for ways to accelerate its planned tightening of fiscal policy. The International Monetary Fund said on Aug. 29 it was studying a request from Argentina to speed up disbursement of a $50 billion loan program after a collapse in investor confidence in President Mauricio Macri's government sent the peso tumbling more than 7 percent to a record low of 34.10 per U.S. dollar. The peso weakened nearly 15 percent in early trading on Aug. 30 before recovering somewhat to trade at 38.50 to the dollar at 11:12 a.m. EDT.